McDonald's announces it will phase out chicken raised with antibiotics. 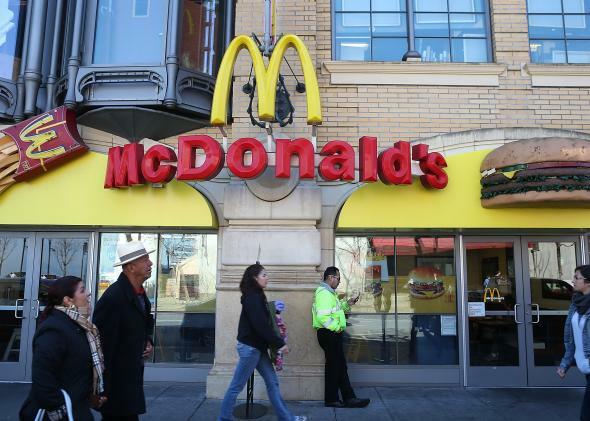 McDonald’s has announced that it will phase out chicken raised with antibiotics. McDonald’s announced Wednesday that it’s phasing out serving chicken raised with antibiotics used in human medicine. The switch should be complete within two years. The move was cheered by the National Resources Defense Council and other public interest groups that have voiced concerns that the antibiotics in our food supply help create bacteria that are resistant to antibiotics. “Investing in healthier, more responsibly-produced meat sure seems like a golden opportunity to win back customers and reputation,” says Jonathan Kaplan, director of the NRDC’s food and agriculture program. As Kaplan’s quote indicates, McDonald’s move is not entirely surprising. The fast-food giant has faced declining sales thanks to competition from outlets like Chipotle and Panera that offer healthier fare. And new CEO Steve Easterbrook made his name as the head of McDonald’s in the U.K. by revamping the menu to reduce salt in nuggets and fries, and publishing nutrition labels. The switch is not entirely complete: The Verge notes that the phase-out will happen only at the 14,000 U.S. locations, not the 22,000 international outlets. But still, the decision could have a widespread influence. The home of the Big Mac sells more chicken than beef, the New York Times reports, and so can exert its influence over suppliers like Tyson.